Like an emperor Thor reigns over this awesome ReFill while emulating the Moog Source. 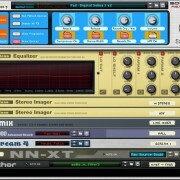 Thor Source brings the character of the Moog Source into the Reason Rack! 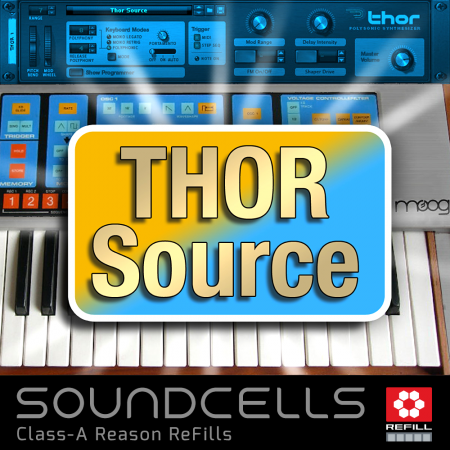 Thor Source is adequately emulating a well known classic from Moog: the Source. Thor’s modular design is giving the chance to rebuild the Source’s details with great accuracy. 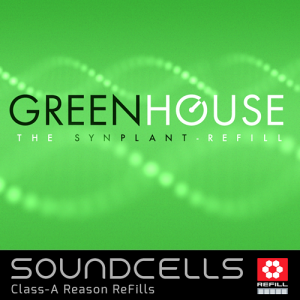 Soundcells copied the favorite Source patches with great ease into Thor and after this it was managed to take those sounds numerous steps further. The sounding results however stayed amazingly close to the Source’s character. In this ReFill’s documentary folder you’ll find proof of this. Thor makes the Source polyphonic and velocity sensitive as well. By now you’ll understand that this ReFill goes way beyond only emulating the past. Thor Source offers you deep and fat basses, retro and nu style leads, wonderful keyboard sounds, mouth watering pads, analog drums and more. 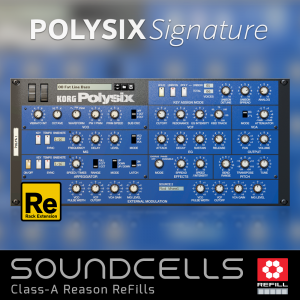 Tweak the rebuild Source sounds in whatever direction using Thor’s tools or just ‘build’ your own Moog Source while using the raw oscillator samples and/or the sampled Source sounds embedded within the NNXT patches. Please always take your time to try every combinator button and knob as well as the Modwheel to get a good taste of all flavours these 214 fine combinator patches will present you with! 25 original documentary patches as described above plus 25 contemporary velocity versions of these patches. 25 legato versions of the documentary patches, and also 25 legato versions of the contemporary velocity patches. 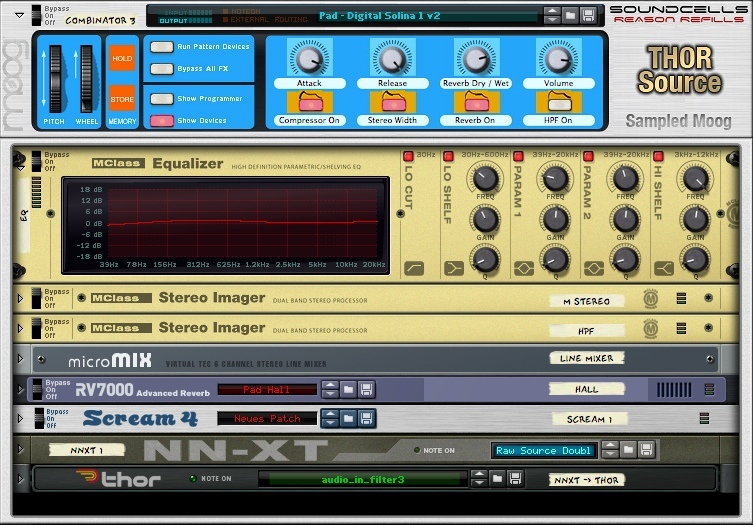 • 74 processed combinator patches making full use of Reason’s devices like the RV7000, the Scream, Pulveriser, Alligator … This folder is subdivided into 4 sections: Bass, Keys & Leads, Misc and Pads. 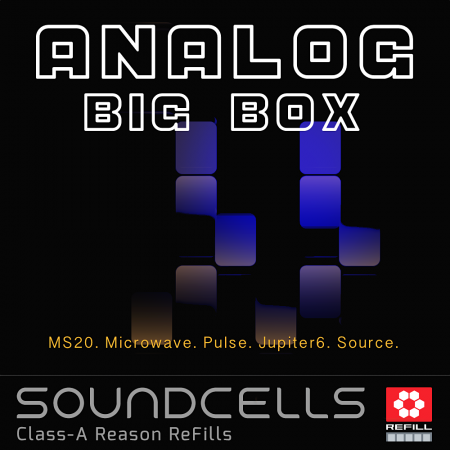 • 55 combinator patches based on the sampled raw oscillator settings and the fully sampled Moog Source sounds which were added to version 2 & 3. • 45 grooving rex loops. • 5 demo tracks in Reason format included. 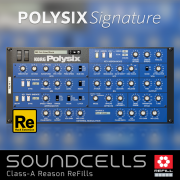 Reason 6 and up needs to be installed to use this product. 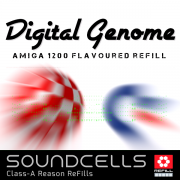 A fantastic refill! Great for me as I’m into 70s/80s stuff but superb all round. Really good tweak-ability and nicely constructed combis. I’m still playing around with it and highly recommended.